Rockford Fire Department chose LDV to build their new 53ft. 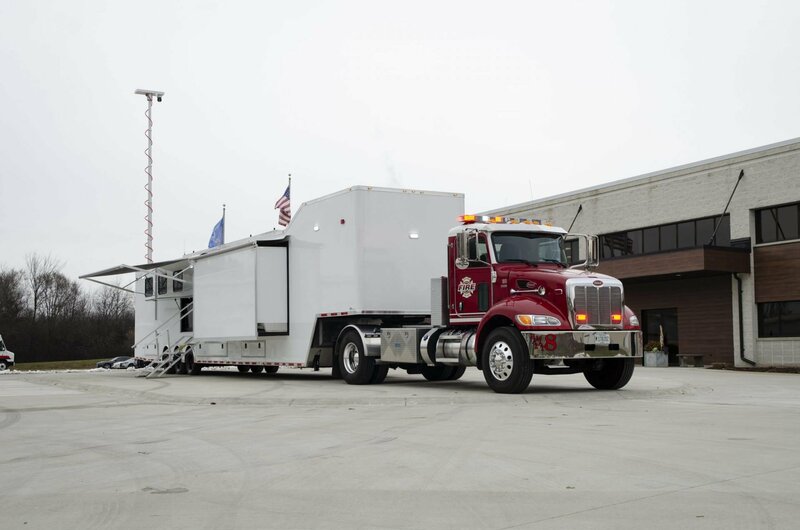 Mobile Command Trailer. The trailer is built on a Quest Steel 8.5ft. wide X 7.0ft. high X 53ft. long trailer with 10,000lb. Torsion axles, two flat-floor slide-out rooms, trailer leveling system and more. The unit features an exterior awning, four 13,500 BTU low profile rooftop A/C units, bunk area at the front of the trailer for additional space, underbelly storage that spans nearly the entire length of the trailer, custom fabricated aluminum cabinets with magnetic dry erase boards, a Wrico Platinum series 25kW generator housed within a custom generator box, a Tempest heavy-duty telescoping pneumatic mast, a driver training simulator, interior workstations and more. Aluminum Weathershield Awning – 17ft.